Google was unable to post the entire post I intended so the last in the series of posts on the economy is presented in two parts, A & B. Part A pertaining to Reducing Regulation & Controlling Regulatory Costs is below. Part B will cover Lowering Individual Income Tax Rates, Lowering The Corporate Income Tax Rate, Full Expensing, Repatriating Earnings, & Opportunity Zones & will be issued next week. 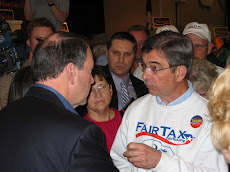 Both Parts A & B taken together make up the entire post that should be considered the last in a series of three that covers the features of the Tax Cuts & Jobs Act of 2017 (TCJA) that blend in with the Trump administration's policies & practices that will enhance the productivity growth component of the overall economic growth equation thereby propelling continued economic growth in America forward. The first two posts in the series respectively covered the importance of continued economic growth in America & the headwinds facing economic growth. Ten days after his inauguration President Trump issued Executive Order 13771 of January 30, 2017 regarding Reducing Regulation & Controlling Regulatory Cost. The executive order confirmed Trump's commitment to fundamental regulatory reform for the American people & businesses by reducing, amending, & eliminating unnecessary regulatory burdens that are ineffective, duplicative, & obsolete - thereby promoting economic growth & innovation while protecting individual liberty. For instance, the Trump administration delayed or repealed more than 1,500 BO-era regulations. 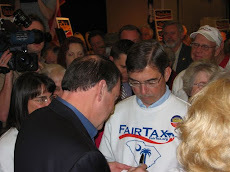 In addition, the aforementioned executive order not only called out the importance of managing both public funds but also the costs associated with the governmental imposition of private expenditures required to comply with Federal regulations. Accordingly, for every one new regulation issued, @ least two prior regulations must be identified for elimination. Further, the total incremental cost of all new regulations, including repealed regulations, shall be no greater than zero meaning that any new incremental costs associated with new regulations shall be offset by the elimination of existing costs associated with @ least two prior regulations. 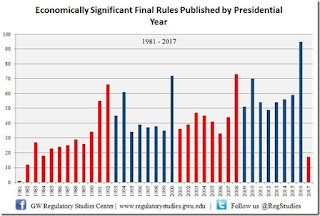 In this regard the above graphic shows that the number of economically significant final rules published in 2017 by the Trump administration was the lowest since 1982 published under the Reagan administration. Economically significant rules are regulations issued by executive branch agencies that have an annual effect on the economy of $100 million or more or adversely affect in a material way the economy, a sector of the economy, productivity, competition, jobs, the environment, public health or safety, or State, local, or tribal governments or communities. The lower the number of such final rules the better in reducing regulation & controlling regulatory costs. The graphic below shows that the number of significant rules published by the Trump administration in 2017 was very small compared to every other presidential year going back to 1994. Significant regulations, which include economically significant regulations defined above, are principally those that may create a serious inconsistency or otherwise interfere with an action taken or planned by another agency plus a few other similar matters. Again, the lower the number the better. 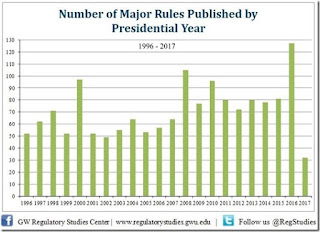 The graphic below shows the number of major rules published in 2017 by the Trump administration is far & away the lowest number ever published in the entire history of this topic which dates back to 1996. 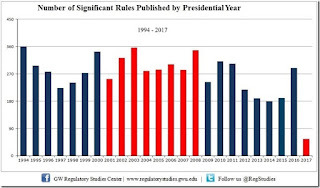 The Government Accountability Office reports on major rules published which includes much of the above definitions of significant & economically significant rules plus includes the ability of U.S. based enterprises to compete with foreign based enterprises in domestic & export markets. Although President Trump is doing his best to reduce regulations & control regulatory costs there are sticky regulatory problems in the Washington DC swamp. Clyde Wayne Crews Jr., Policy Director @ Competitive Enterprise Institute, writing in Forbes compiled the following summary table & analysis (A through D below) that shows the results of Trump's work regarding Regulatory & Deregulatory Actions – Spring 2018. D. The Long Term category (requires Congress to act) is reversed with 87 Regulatory actions & 32 Deregulatory actions: counter ratio 2.7 to 1. Point D above shows the problems encountered when Congress gets involved. 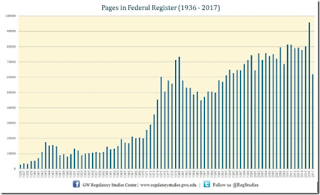 The following table shows the number of pages in the Federal Register from 1936 through 2017. 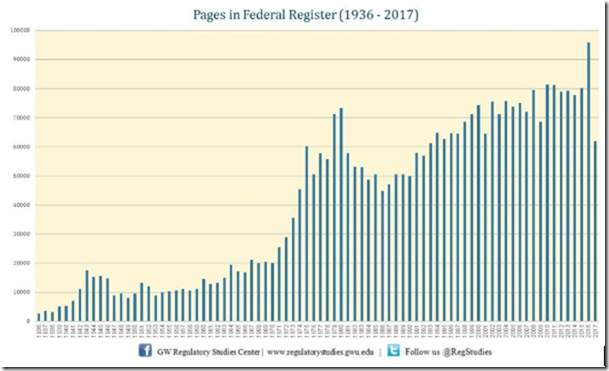 The 61,950 pages (includes regulatory & deregulatory actions) published in 2017 was the lowest since 1993. The Federal Register is the daily journal of the federal government in which all newly proposed rules are published along with final rules, executive orders, & other agency notices. 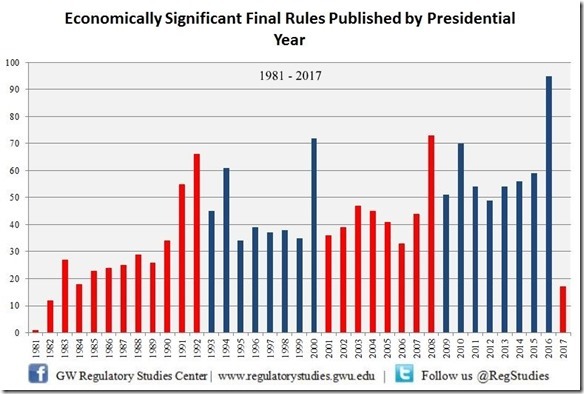 It provides a sense of the flow of new regulations issued during a given period & suggests how the regulatory burden will grow as Americans try to comply with the new mandates. The above is presented to provide an idea of the gargantuan task President Trump faces in trying to reduce regulations & control regulatory cost. He obviously has a long way to go. But investors & entrepreneurs are appreciative that Trump, like Calvin Coolidge, is a friend of business who knows that the "business of America is business" & that regulations hinder business formation & growth. In this regard, Apple has said it plans to create 20,000 jobs & invest $30 billion in the U.S. over the next five years, including a second campus in Austin, Texas. And, earlier this past week Volkswagen announced it is adding a second Chattanooga, Tennessee assembly plant to build electric vehicles – an $800 million investment expected to create 1,000 U.S. jobs. In addition U.S. Steel has announced it will restart two blast furnaces & steelmaking facilities that have been closed since 2015 – one in March (500 jobs) & the other in October (300 jobs). The point is Trump is trying to reduce regulatory burdens on businesses & they know it & that has produced an entirely different attitude – one that we haven't seen since the 1980s. Merely skimmed this - don't pay taxes and this is way over my head. "Don't pay taxes"? - taxes are embedded in everything you buy. The corporate income tax, & the cost of complying with all the regulations imposed on businesses are paid every time you buy something. Doug – exceptional research with great details! Your research leads to increasing support to continue a more free and robust economy. Trump must continue utilizing executive branch levers as legislative successes are now much more challenging. This then may continue GDP at 3-4% annual growth rates. However, for Trump or GOP to have any chance of winning in 2020, they must concisely contrast benefits of more free market capitalism vs socialism. Start by calling out Dems infatuation with Sweden, touting that brand of “Democratic Socialism” as model for the US. Sweden ended its debacle with 20+ years of Socialism in 1990’s to avert near total economic collapse. Sweden today is arguably more capitalist than the US, and dramatically less socialist than what Dems are calling for today. Dems are naïve on economics but extremely effective with propaganda.